The mind behind, Jim Clendenen, is a California original whose long hair, cooking skills, bigger-than-life personality and wines are legendary. As a pre-law student at UC Santa Barbara, he developed an interest in wine, particularly after trips abroad to visit Bordeaux and Burgundy. He learned winemaking under Ken Brown at Zaca Mesa Winery, later partnering with Adam Tolmach and Bob Lindquist at Qupé Vineyards. He also was influenced after spending time in 1981 at Domaine des Comte Lafon and Maison Nicolas Potel. 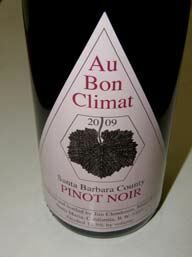 He founded Au Bon Climat in 1982 and quickly put the Santa Barbara region on the map as a source of premium Pinot Noir and Chardonnay. Clendenen always touts restraint and balance over extraction and power. His lower-alcohol, higher-acidity wines, for which he was criticized early on, are now in vogue among younger winemakers in 2012. His wines have always shown age ability, but often did not receive high scores in the wine press. His winery is at Bien Nacido Vineyard (no tasting room at the winery). 68 acres are owned, 100 acres are leased or controlled. Viticulturist is Jim Frey and Chris Hammell (Bien Niacido). Besides Au Bon Climat, multiple brands are produced including Cold Heaven, Ici/La-Bas, ll Podere Dell' Olivos, and Vita Nova. The Pinot Noirs, which are sourced from many of Central California's most prized vineyards (Sanford & Benedict, Nielsen, Los Alamos, Sierra Madre, Le Bon Climat and Bien Nacido) are highly lauded for their restraint. 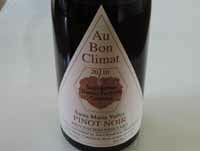 Annual production is 40,000 cases of primarily Pinot Noir and Chardonnay, of which 20% is estate grown. 805-937-9801.